Director Franc. 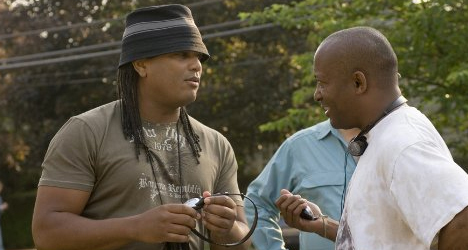 Reyes talks to producer John Singleton on the set. Filmmaker Franc. Reyes is still rising in the industry. Winner of the Emerging Filmmaker Awards at the 2002 Alma Awards for his film “Empire,” which starred John Leguizamo and Peter Sarsgaard, Reyes, who is of Puerto Rican decent, went on to make the 2007 film “Illegal Tender” (out on DVD Dec. 18). The movie starred Rick Gonzalez, Wanda De Jesus, and Dania Ramirez. A songwriter by trade, Reyes has seen some of his work in the music industry hit the Billboard Music Top 40 chart. It’s his new venture in the film industry, however, that Reyes is most passionate about. 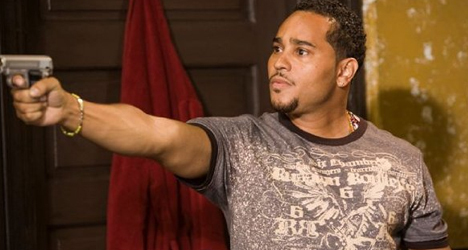 He is currently shooting his third feature film “The Ministers,” which stars Harvey Keitel, Leguizamo and De Jesus. He spoke to me via phone last week about the writing process, film critics, and the challenges he faces as a Latino filmmaker in Hollywood. “Illegal Tender” was your second feature film as a director/writer and now you are currently working on your third. How have you seen yourself grow as a director and writer over the last five years? Franc. Reyes: There are a lot of different ways to grow and I think I have been fortunate enough to work with people you can learn from like John Leguizamo, Sonia Braga and Isabella Rossellini. You are not only the writer and director of “The Ministers,” you are also the producer for the first time in your career. What has that experience been like? It’s about knowing all the angles. I think it would be difficult now to go back and direct a movie that you don’t have a hand in producing. It’s difficult to really be a well-rounded filmmaker when you don’t know everything that is going on. I think producing helps me do that. What’s more challenging, writing a song or a screenplay? Oh, a screenplay by far. When you are writing songs, it’s a different part of your mind; a different part of your talent. When you’re writing a screenplay, you’re writing words, characters, emotions – all kinds of stuff. It’s a lot longer process. What is it about the gangster genre that you like so much? All three of your films seem to have that feel. With “Empire” you are talking about the gangster genre. With “Illegal Tender,” not that much. To me, that is more of a mother and son story. “Empire,” for that matter wasn’t a traditional gangster movie either. Would you like to try another genre entirely someday? Maybe. I might want to do a comedy one day. I’m hoping to do other things, but it all depends on where you are in life. Critically speaking, “Illegal Tender” wasn’t accepted as well as you probably would have liked. Do negative reviews bother you or do you look past them? I don’t concern myself with it. Universal Pictures said “Illegal Tender” received some of the best exit polls from audiences they’ve ever had. [Negative reviews] don’t really bother me. “Illegal Tender” was one of the few films this year with a majority Latino cast. Do you think this is a problem in Hollywood and, if so, are helping to remedy it? I don’t make movies for Latinos. I make movies with Latinos in them. If Latinos want to go see them it’s a beautiful thing. But I make movies with Latinos in them for everybody. You received the Emerging Filmmaker Award at the 2002 Alma Awards. This specific award hasn’t been presented to anyone else since then. Does that say anything about the industry and how difficult it is for Latino filmmakers to break into the field? There are Latinos out there that are making movies. Whether they get a theatrical release or not is a whole other story. It’s not an easy run. It’s not easy to make movies in the first place. To be a Latino filmmaker is even more difficult because of the reality of Hollywood. Well, you did receive the award so, five years later, do you feel like you have emerged or is there still more to come? Oh, yeah. I’m not even remotely there yet. I still have more to say and am going to keep going.